Our Thanksgiving will be extra special this year, as this will be our first Thanksgiving in Colorado, and the first time in many years that we will celebrate with both children and their families. It will also be my granddaughter's first Thanksgiving! I have been cooking and preparing for days and I am hopeful my experience cooking a 22-pound turkey at high altitude will be a good one. I'll let you know in a later post! My oldest grandson, who will be five next month, will lead us in grace this year. He is so serious when he tells us to "fold our hands together like angel wings, place them in our lap and bow our heads," and then he recites a prayer he learned in Sunday school. Is there anything sweeter and more sincere than a child at prayer? We have much to be thankful for this year, and I pray that God will bestow more blessings on us in the year to come. Life becomes more precious to me with each passing year, as I become more aware that the years ahead will be shorter than the years past. I try to savor the joys of each and every day and be thankful for each day's beauty. I appreciate each and every one of you, as you have enriched my life in many ways and I value your friendship more than you can ever know! 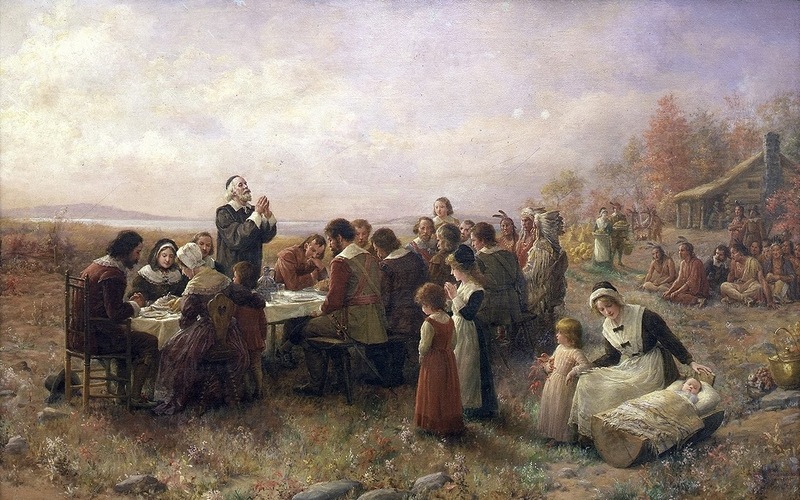 Wishing you all a most wonderful and blessed Thanksgiving Day! 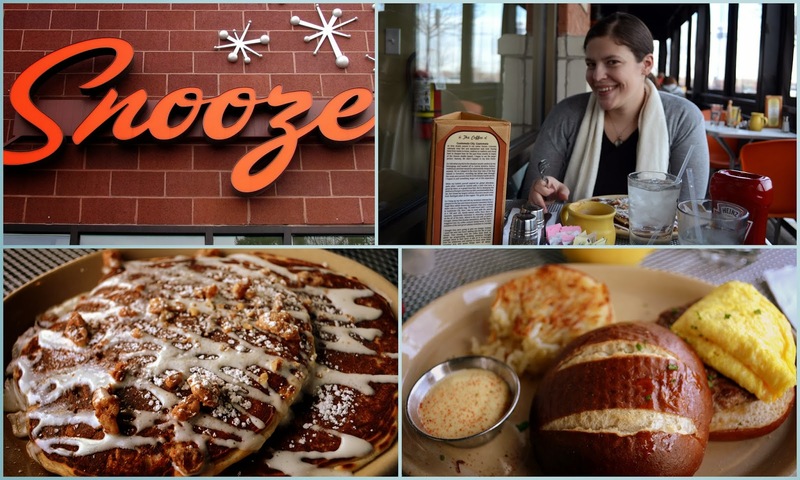 It was my daughter's birthday this week and as part of her birthday celebration we went out for a ladies day brunch to celebrate at one of the popular breakfast restaurants in the Denver area called "Snooze." She had a serving of carrot cake pancakes and I enjoyed a pretzel roll, filled with scrambled eggs and a sausage patty, with hash brown potatoes on the side. Both entrees were delicious! After breakfast, we went to the annual Mile High Holiday Mart sponsored by the Junior League of Denver. (Click on the above photo--and all other photos in this post--once to enlarge it, and again to see it at an even larger size). The Junior League of Denver, established in 1918, is an organization of women committed to promoting voluntarism, developing the potential of women and improving communities through the effective action and leadership of trained volunteers. Its purpose is exclusively educational and charitable. The mart was held in the Denver Marriott Tech Center. 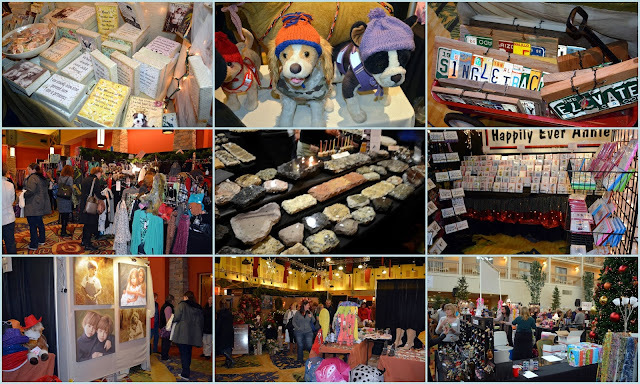 There were many interesting vendors and merchandise for sale for every taste. I thought these alphabet letters carved from actual vintage Readers Digest Condensed books were so interesting! 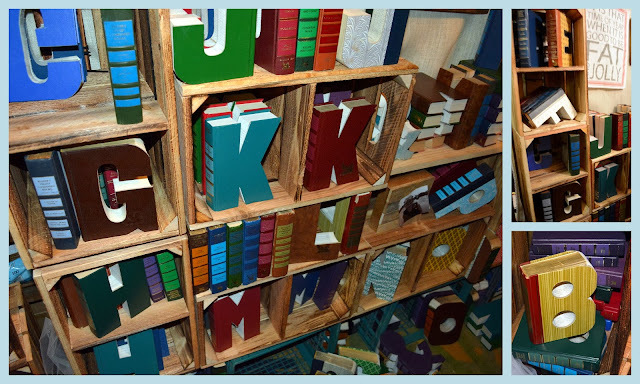 My parents had a large collection of these books when I was growing up, and I thought this was a unique way to recycle them into a fun, decorative item. Do you see your name on Santa Claus' "Nice" List? Later in the day my husband and I babysat our granddaughter for the night, so she and my son-in-law could go out to a movie and sleep late the next morning. For a new parent I think that is the best gift in the world, don't you agree? We had a few blustery days and all the leaves have left the trees in my neighborhood, leaving the landscapes dry and barren, except for the evergreen pine trees that are in abundance in my neighborhood. The beauty of autumn has passed, but the upcoming Thanksgiving holiday gives us much to look forward to. 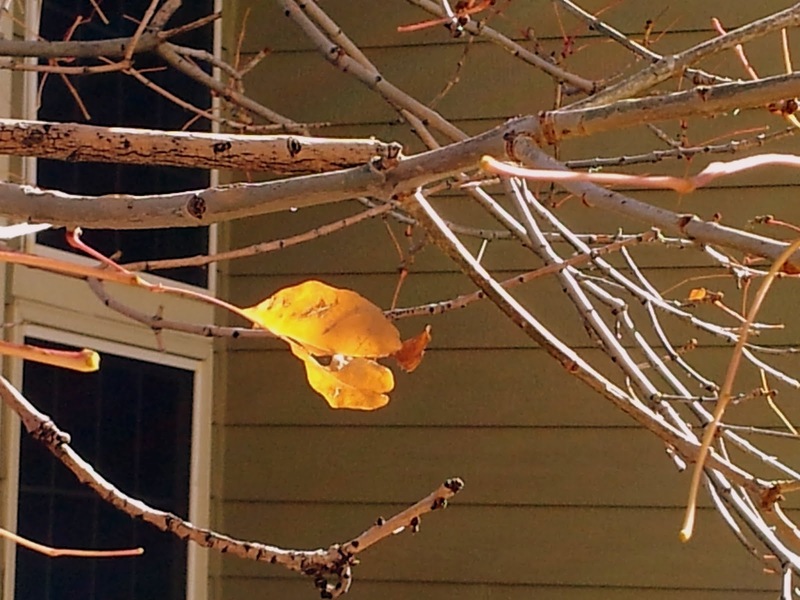 I leave all my autumn decorations out until after the holiday. There won't be a hint of Christmas in my house until after Thanksgiving. 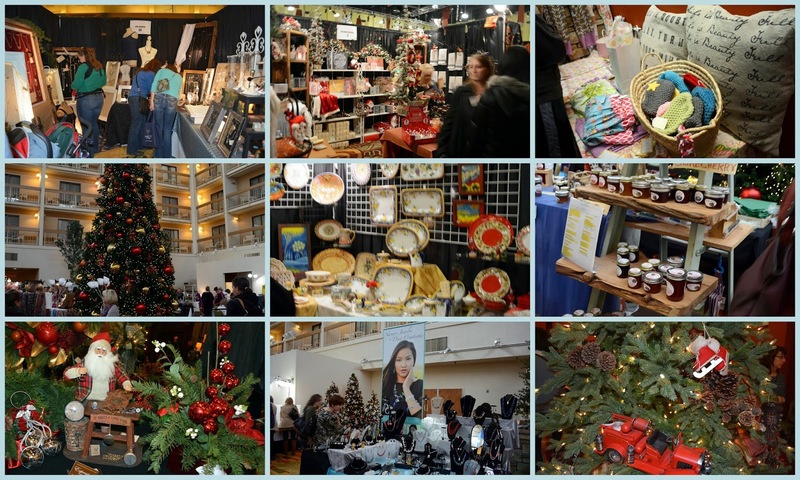 I do not like to rush the seasons, even if Santa Claus is already at the mall, Christmas carols are playing on the radio, and I have been busy checking and buying from Amazon "wish lists" for gift ideas for my grandchildren. Today we had our first significant snowfall, and later in the early evening, I was surprised with a parade of deer that traveled through my backyard. 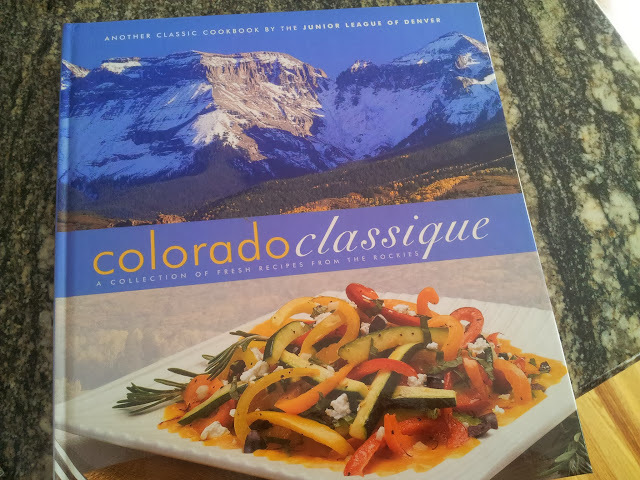 I am busy planning my menu for the big Thanksgiving feast, and I'm sure many of you are doing the same. I try to buy the largest turkey I can find, and we will also be having a ham because I welcome leftovers! I make delicious turkey soup from the turkey carcass, and pea soup from the ham bone, and I think I almost look forward to that as much as I do the holiday meal! What is your favorite dish to eat on Thanksgiving? 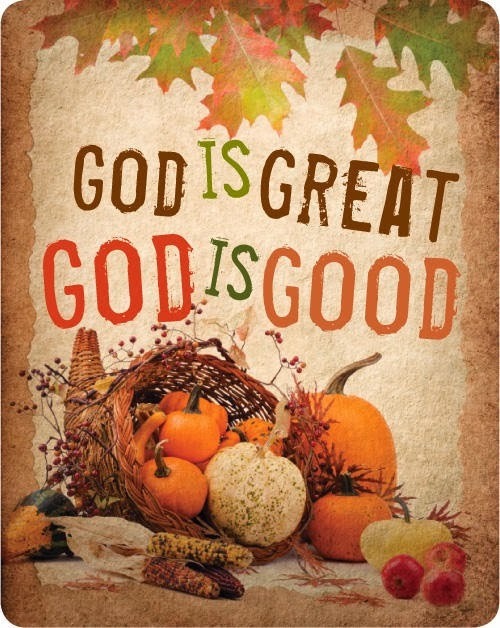 We have much to be thankful for, and I have been counting my blessings each and every day. I want to keep a joyful heart and enjoy Thanksgiving and Christmas this year, remembering what those holidays really mean, without all the extras we so often burden ourselves with. Less stress, more joy! I hope I can make it so! As you can see, we are close to quite a bit of wild, open space, and some of the homes have spectacular views of the hills. The mighty Rockies are located not far behind the rows of foothills, but we can't see them, as we are too close. It's sort of a paradox, but in order to see the mountains above the foothills, one has to drive away from them, further east. 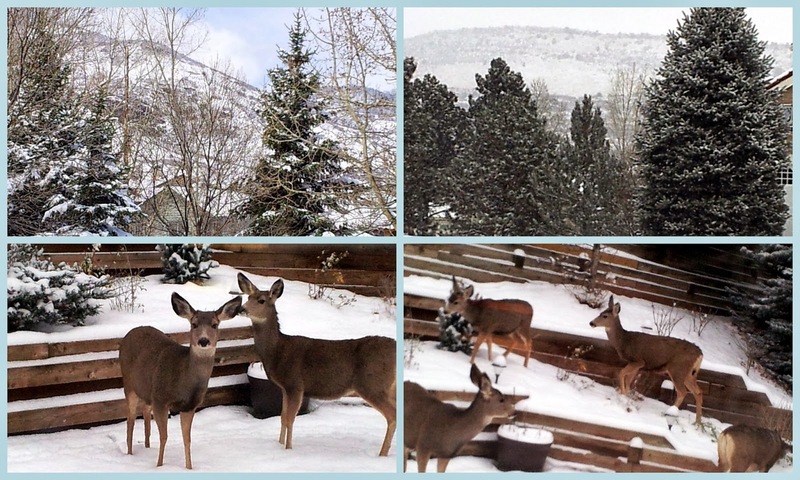 Living close to so much open space is one of the reasons we see so many wild animals in our vicinity, especially mule deer, who like to come down into our valley and graze. At the highest point in our community's valley, and where I took all the overview photos above, is The Manor House. 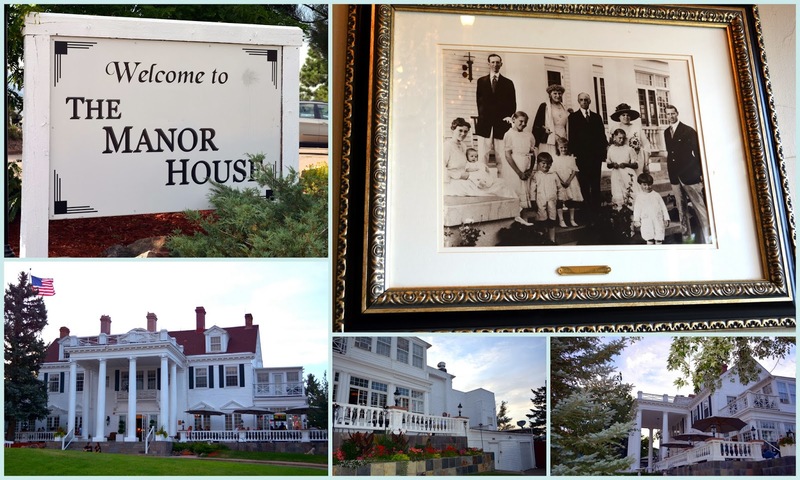 The Manor House is one of Colorado's most historic residences. The 8,000 square foot Manor House was built in 1914 by John Shaffer, the editor, and publisher of the Chicago Tribune as well as the owner of the Chicago Post and The Rocky Mountain News. Shaffer purchased 3,500 acres of land now known as Ken Caryl Ranch, named after his two sons, Kent and Carroll. Over time, Shaffer added on more property until his cattle ranch was over 10,000 acres large. The Manor House was the site of frequent entertainment in the Shaffer years, and frequent guests were President Theodore Roosevelt, and President William Howard Taft, as well as industrial chieftains from around the world and celebrities of the time. For nearly a century, the house passed on to be the private residence of other ranchers and a continuing gathering place for Denver's society. To see more historical photos of the Shaffer family and The Manor House look on the Manor House website - click here. Today, the mansion is privately owned and is a popular event center, used as a setting for weddings, corporate events, and holiday celebrations. My husband and I went to one of the three evenings per week that the house is open to the public when they offer cocktails and light food fare menu. It was a beautiful evening and we sat on the veranda. 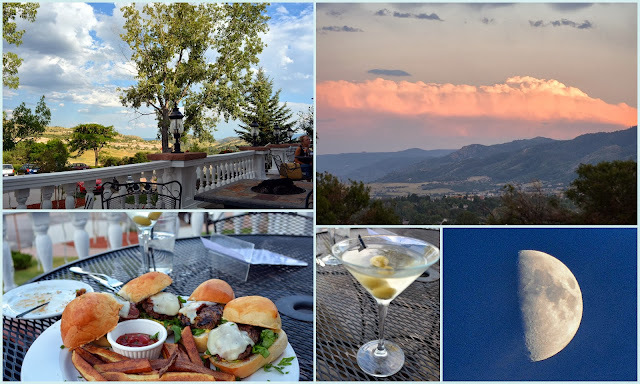 We each had a martini and shared a platter of sliders, while we watched the sun go down and a beautiful moon rise. I wanted to take photos of the mansion's beautiful interior, but I was told by a waiter that was not allowed as they had their own "official photographer." After a little research, I did find photos of the interior form the past on the Electronic Library of Colorado Architecture, Landscape, and Planning, which you can see at this link, and on the Manor House web site at this link. One of the reasons many area brides and grooms like to have their wedding reception at The Manor House is this wonderful view of the skyline of Denver that can be seen from the house through the hogback structures that our valley rests behind. It looks very dramatic as the background for wedding photos! The wild open spaces and The Manor House itself also looks fantastic in photos, in every season of the year. A closer view of the city of Denver. No matter which direction one looks, the view from The Manor House is spectacular! My husband and I feel fortunate to be part of this wonderful community and we are enjoying learning about the history of this area and the West in general. 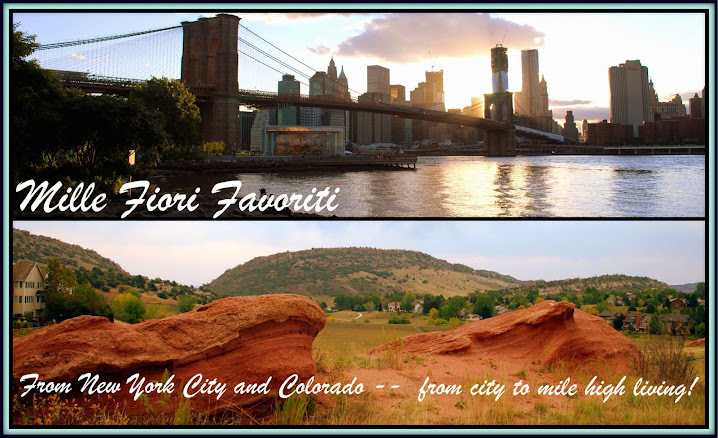 The city of Denver has a colorful past, and I have been enjoying learning more about it. No matter where one goes, or where one lives, life is interesting and there is something new to learn. Don't you agree? Can you believe that next year will be the 75th anniversary of the movie, The Wizard of Oz," based on L.Frank Baum's original book, written in 1900, entitled "The Wonderful Wizard of Oz"? 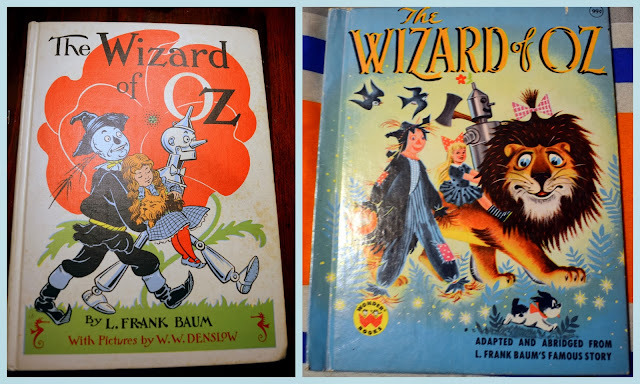 I still own my two childhood copies of later editions of the book, where the titles were changed to match the popular 1939 movie title. I was always enchanted with this story, although the original book version is somewhat different than the movie version, as often is the case. In the book, Dorothy's shoes were silver, but in the movie version, they were changed to the color red, as that color showed up more dramatically for a technicolor film! The movie version of The Wizard of Oz began showing on TV in 1956, and I have fond memories of anticipating its yearly TV screening in the years afterward. The flying monkeys were always the scariest part in the movie to me, but in the book, the Wicked Witch used even more scare tactics to try to keep Dorothy, the Scarecrow, the Tin Man and the Cowardly Lion from reaching the Emerald City and the Wizard of Oz! 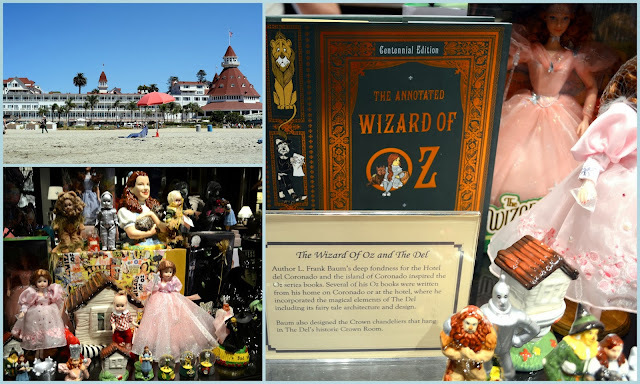 When I was on a recent trip to San Diego, California, I found out on a tour that L. Frank Baum and his wife were frequent winter guests at the Hotel Del Coronado, that is located on Coronado Island, across the bay from the city of San Diego. He wrote three more Oz books during that time: Dorothy and the Wizard of Oz, The Emerald City of Oz, the Road to Oz, and parts of The Marvelous Land of Oz. It is said that the hotel's iconic red castle-like turrets and enchanted fairy tale setting inspired Baum, and the island of Coronado is even nicknamed "The Emerald City"
Later, Baum rented this house near the Hotel Del Coronado, located on Star Park Circle. It is now a private residence. The house is proud of its Oz connection! It has even allowed the Wicked Witch to visit! 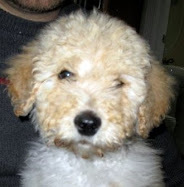 ...his real name was Frank Philip Wuppermann. He was born in New York City and is buried in the historic Green-Wood Cemetery in Brooklyn, New York. You can see the skyline of Manhattan while standing near his grave site. I also think the Manhattan skyline looks a little like the Emerald City! PS: My photo of the Manhattan skyline was taken a few years ago before the new One World Trade Center was built. 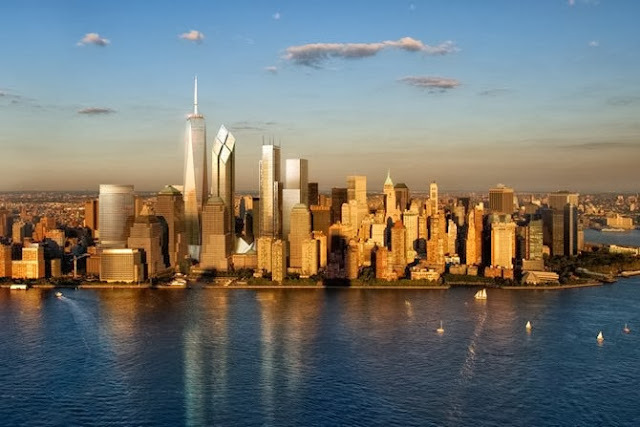 Standing at a symbolic 1776 feet, 1 WTC was recently officially named the tallest building in North America by the Council on Tall Buildings and Urban Habitat. An artist rendition of what the new New York City skyline will look like when the new World Trade Center buildings are completed. It's going to look even more beautiful than ever, isn't it? When my husband and I went on our first visit to Rocky Mountain National Park in mid-September, it was the beginning of the elk mating season, called the "rut". This brief time of the year is when the male elk winners in the reproductive game are separated from the losers. The elk rut is more exciting to see than that of the deer family. Bull elk go all out to show their worth to the cow elks. 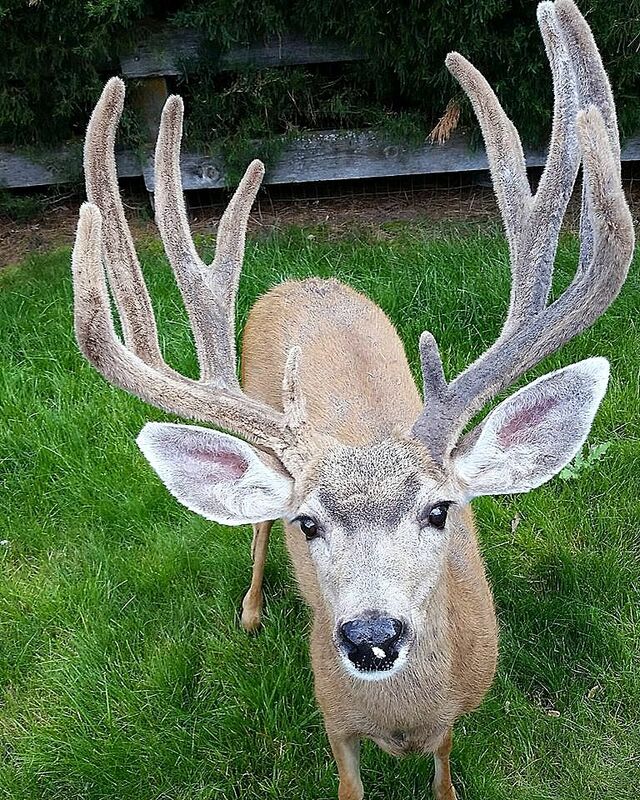 His antler size shows his age and strength, and the volume and pitch of his bugle determine how far it can be heard. These attributes are used to attract elk cows. He collects a harem of cows and defends them from other bulls. It is an exciting spectacle to see, and we were hoping we'd see at least one bull elk during our visit to the park, and hear his bugle. We read that the elk are most active in the evening through the night, so we entered the park in the early evening the first day we arrived and drove to one of the popular elk viewing areas. Moraine Park is a valley formed by the Thompson glacier and is a popular grazing area for the elk. One by one they came down in a long line, as we watched and took photos. Finally, the Bull elk appeared. 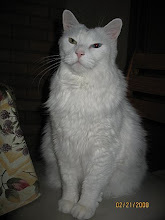 He looked right at us but seemed unperturbed. 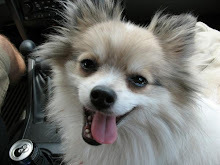 I was happy I was safely seated in my car! A Bull elk's antlers can weigh up to 40 pounds, and this one looked massive. After glancing our way a few minutes he ran off to join his harem in the meadow. If you notice, one of the elk cows is wearing a collar, which means she is being tracked by the park rangers. This is done as part of a study to determine migration and health of the animals. Another look at his magnificent antler rack! ....Horseshoe Park, again a valley formed by a giant glacier long ago. Here we saw this big boy, sitting leisurely in the meadow, chewing his cud. I am using a power zoom lens to get these photos as we were standing a safe distance away from him. All of a sudden the bull elk stood up and started to move quickly towards his harem of cows. 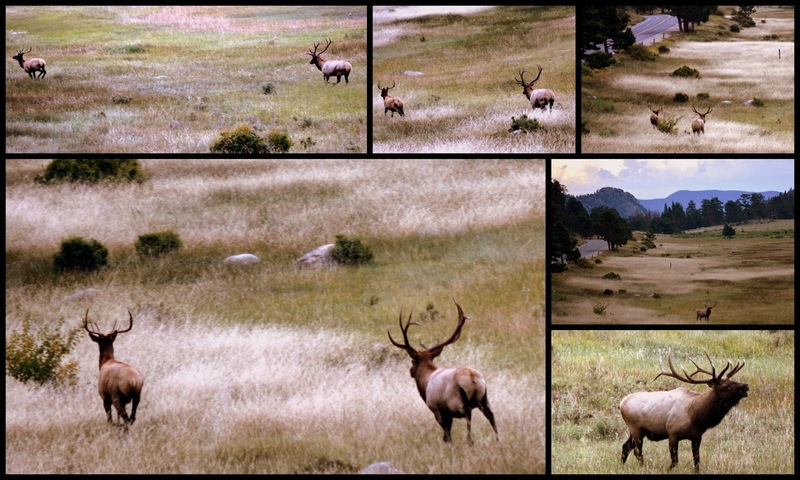 In the photo collage above you can see the cow harem in the upper left, another, younger bull elk approaching in the bottom left, and the big bull charging in the upper right. 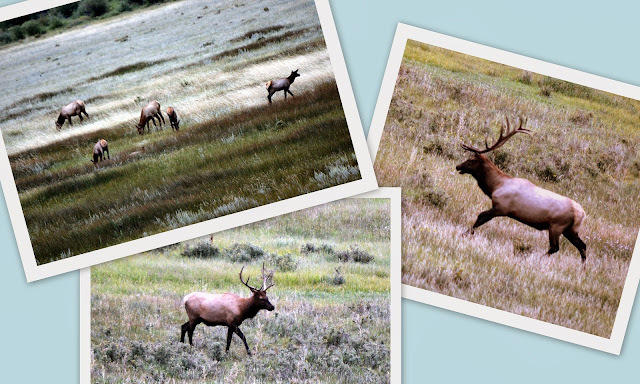 The older bull elk chased the younger bull away, as you can see in the series of photos above. (Click on to enlarge) Afterward, he let out a very loud bugle. He made sure his harem knew he was the boss. It was an exciting spectacle to witness! We were very happy to have witnessed this act of nature in this spectacular setting! Rocky Mountain National Park is truly a national treasure. Our elk adventures were not over for the day, however, as we met this enormous bull elk in the middle of a street median in Estes Park ...if you missed that post, go here. 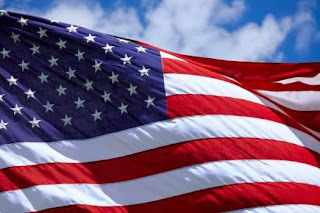 Wishing everyone in the USA a very Happy Veteran's Day! May we recognize and honor the brave sacrifice of those who have served in our country's military -- all gave some, some gave all. Freedom is not free, and I thank all veterans who have helped to preserve our freedoms!